Looking for something festive and bubbly to ring in the New Year? Alcohol is a Paleo gray area, but plenty of people are fine with it at least occasionally, and if you’re going to indulge, it ought to be something really delicious. 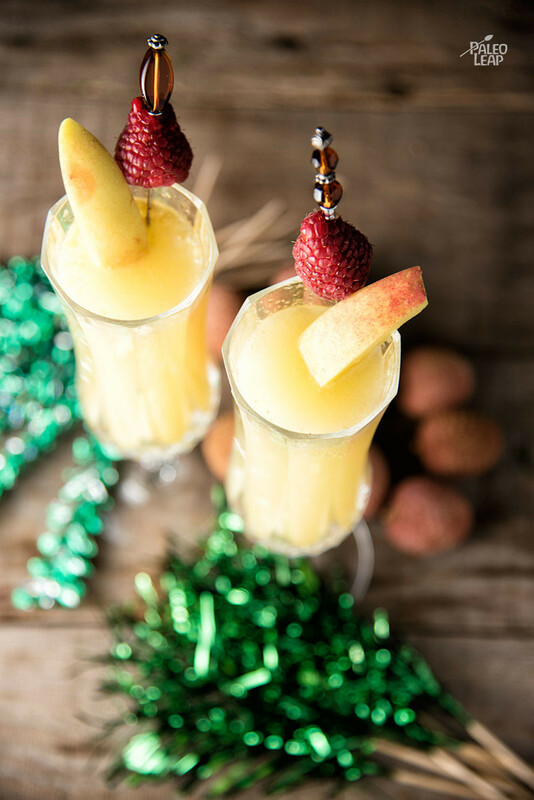 This drink starts with a classic Bellini recipe, but adds a sweet and almost floral flavor from the lychee fruit to complement the peach juice. Lychee fruit (also spelled litchi or leechee) is native to China and most popular in Southeast Asia, where it’s been a popular dessert fruit for hundreds of years. Outside of Asia, it’s available in bigger grocery stores (or take a hike down to a Chinese grocery and stock up on spices while you’re at it!). Lychees have a red skin on the outside (peel this of before pureeing them), but on the inside the flesh is white. On the nutritional side, they’re rich in Vitamin C and a handful of other antioxidants. And for the low-carbers, if you use 12 lychees and 2 cups of peaches for this recipe to serve 6 people, each person will be getting 9 grams of carbs from the fruit in total (4 from the lychee and 5 from the peaches). Of course, if you don’t want to go for the champagne, you could just make this with sparkling water instead for a virgin drink. Either way, it’s a delicious way to celebrate a special occasion. SERVES: 6 PREP: 15 min. Place the peace slices and fresh lychee in a blender. Pulse until you get a smooth texture. If necessary, add water 1 tbsp at a time to help puree the fruits. If you want a pulp-free drink, strain out the pulp with a fine mesh sieve so that only the juice is left. 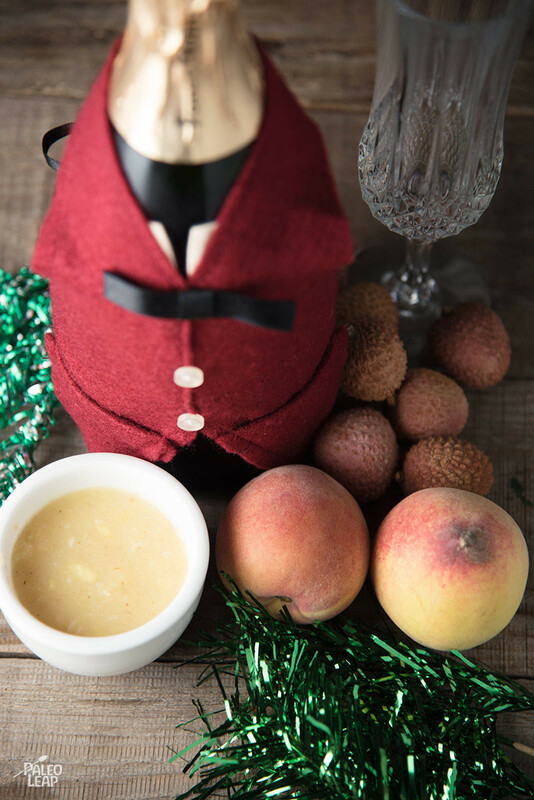 Pour the fruit mixture into champagne flutes until 1/3 to half full. Serve with fresh peach slices.